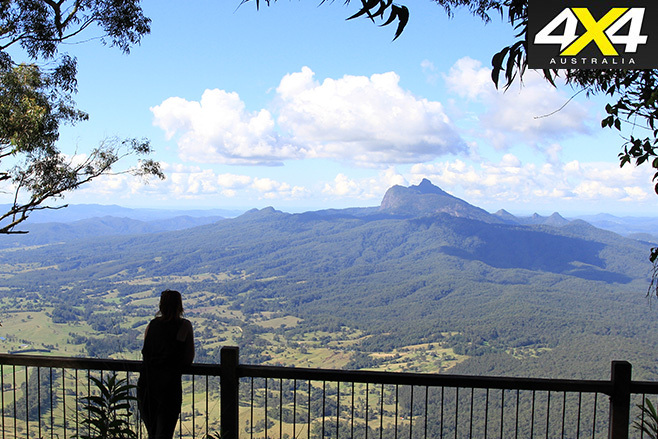 An easy-going but spectacular drive through the Border Ranges National Park on the New South Wales far-north coast. AT the mere mention of national parks most people start yelling about locked gates, no access, no firewood, no four-wheel driving and no fun – it’s even worse when the parks are World Heritage listed. However, these people have probably never been to the Border Ranges that separate NSW and Qld. 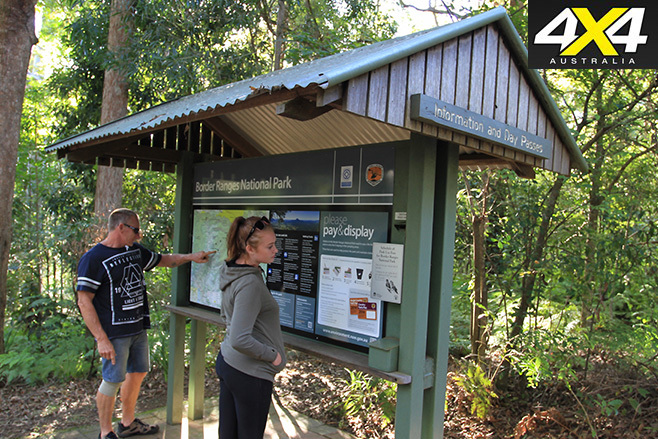 Border Ranges NP was World Heritage listed in 1986, and the parks service has gone to great lengths to offer a wide range of activities for 4WDers and campers. 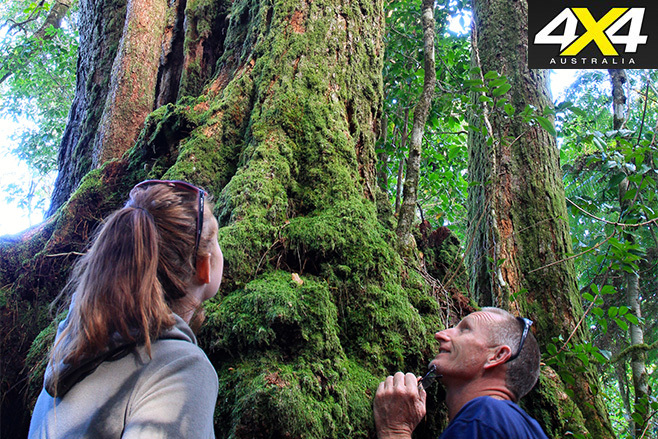 The park features approximately 50 rainforest reserves and its most significant feature is Mount Warning, a largely eroded volcano now around half its original size. The track through the park is only about 100km long, but it’s a great escape from the hustle and bustle of everyday life. 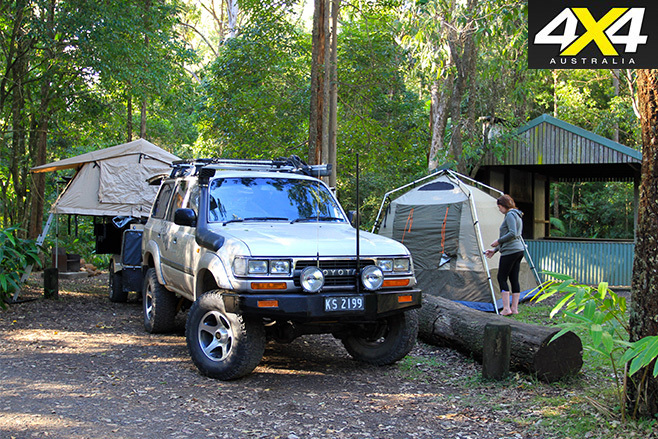 Lying 170km south of Brisbane is Kyogle in New South Wales, the starting point for this trip. Kyogle, a small logging town from way back, is a well-equipped country town where pies are still handmade and where you can get old-fashioned service at a proper garage. The drive gets rolling by heading north from Kyogle along Summerland Way for 12km until you hit the little hamlet of Wiangaree, the last-minute stop for fresh bread, ice and milk. Here you’ll see a road and campsite condition board – critical for this area, as weather conditions can change dramatically. Over the next several kilometres you’ll pass dairy farms and old timber bridges until you arrive at the turn-off for Lynches Creek Road, a well-signposted road that heads towards the Border Ranges. This is where the road starts winding its way into the thick lantana-infested forest. If there’s any moisture about it’s advisable to select 4WD, as the road climbs sharply for several kilometres and there isn’t much room either side. When the road eventually levels out, a sign indicates that Brisbane is only 132km away. Turn right here to head deeper into the forest and pass several stone fruit and cattle farm properties. While not a hard drive, it’s advisable to keep your lights on and your speed limited to 40km/h due to the jump-ups, sharp turns and narrow roads. After 31km you’ll approach the turn-off to the first campground: Sheep Station Creek. If you haven’t already purchased a camping and vehicle pass you’ll need to use the honesty box. The Sheep Station Creek campground has some 40 sites catering for tents and campers, as well as walk-in sites positioned well away from vehicles. The campsite also features tables and chairs, barbecues with fire pits (you must bring your own wood), long-drop toilets, a communal shelter with a large fire box, and information boards regarding walks and local vegetation – we’ve definitely got no complaints about paying fees to use this area. There are several walking tracks to Sheep Station Creek, from where there are formed walking tracks and boardwalks allowing exploration of the cool running creek that cuts its way through boulders and palm trees. Back at the turn of the century the red cedar cutters used this area to transfer logs downstream to awaiting ships. However, the steep contours of the land created a problem, and it’s possible to see where the workers unloaded the massive logs, moved the bullocks around the turn, then reloaded the logs for the next section of the journey. The cutters even blazed their names onto a large rock in the area, which dates back to the 1880s. Weather can change quickly in rainforest climates, so keep an eye out for pesky leeches and mosquitos if it’s a bit moist. You’re required to park the caravans and trailers at Sheep Station Creek campground before following the narrow and steep roads that lie ahead. A left-hand turn at the top of the camp leads deeper into the park, and as the road plateaus you’ll come across another camping area: Forest Tops. This campground is blocked off with bollards lining the road, so you need to carry all your gear in – it’s not too far, but far enough to be annoying. With the usual national park facilities, this spot’s ideal if you’ve packed light. Continuing on from the campsite will lead to a left-hand turn down a tight one-way track – although you can choose to head straight on the main road. Most people choose to turn left and take the tight track that cuts deeper in the heart of the park. It’s advised to use a lower gear here to save your brakes – plus there’s a good chance a lyrebird might dart across the road. At the very bottom of this section are several walks that lead to large red cedar trees and picnic facilities. 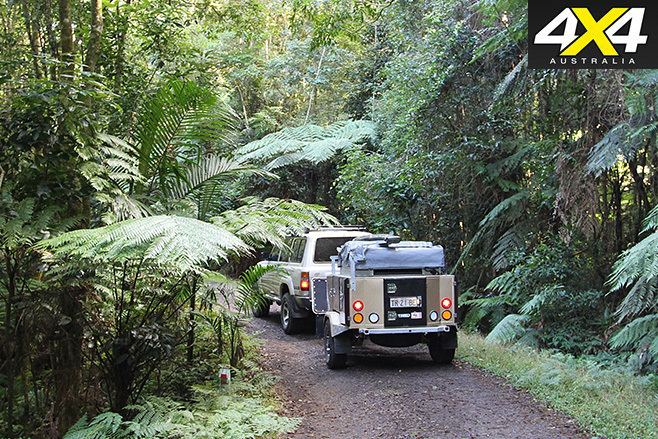 The road that climbs out the other side is somewhat narrow, with tree ferns and vines dangling across. It’s also very steep, with our GPS indicating we were 1000 metres above sea level. There are several informal lookouts and picnic areas on the rim of this road, but pick your time wisely – when it’s cloudy you’ll see nothing. Further along you rejoin the well-signposted main road, so you can wander back to your camper, camp at the next stop or keep exploring. Turning left onto Tweed Range Road there may be traffic, so keep to the 40km/h limit and make it enjoyable for everyone. Continuing along the rim will lead to the Bar Mountain Picnic Area, which has plenty of grass for the kids to play on, a barbecue table, barbecue pits (bring your own wood), undercover shelter and toilets. Be wary if cooking meat as there are resident quolls that will smell your food from a mile away. This is a great spot to unwind, with several walks leading towards 2000-year-old beech trees. The main road quickly descends here, so select high 4WD and take your time, as one of the risks driving in old forests is the chance a rotten tree may fall in front of you. After a short drive the forest starts to shift into a landscape of scrubby timber, lantana and vines. As you approach the 90km mark you’ll come to the other end of the park, which is well signposted. As soon as you pass these signs there are farms, hippie shacks and horticultural igloos in the area, all taking advantage of the rich soil and high rainfall. It seems this area must be lush all year, as the cows are fat and the trees lining the road are covered with stag horns and old man moss. Follow your nose to the T intersection, turn right and follow Williams Road past flowing creeks and hidden bed and breakfast retreats. Unfortunately the tar soon turns up and you’re forced to turn right to Kyogle or left towards the coast through Murwillumbah. There is one other choice: turn around and do it all again! 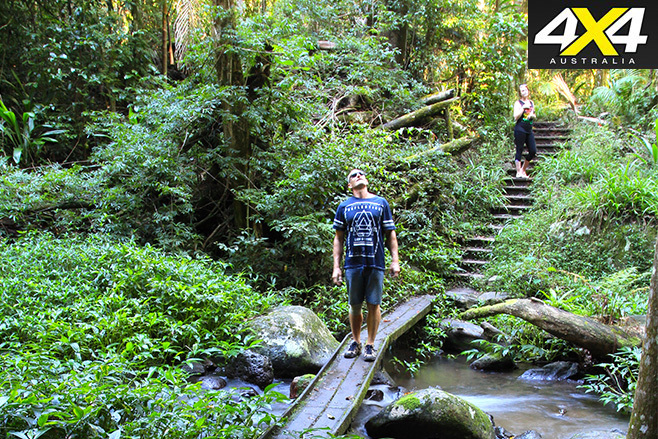 The Border Ranges National Park is situated on the Queensland/NSW border, just 150km south of Brisbane. Access is from Kyogle in the west or near Murwillumbah in the east. The Kyogle loop is approximately 90km long. All the campsites have good basic facilities including pit toilets, barbecues (bring your own wood), water for washing and cleaning, and information boards. Caravans and trailers are not permitted from the eastern end or past Sheep Station Creek camping area. Forest Tops camping area is walk-in only. 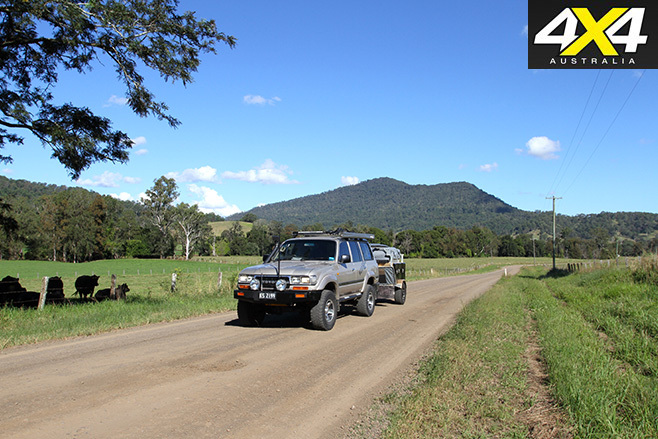 The nearest major town is Kyogle, which is a friendly country town with several fuel stops, mechanical services, plenty of shops, a local caravan park and an information centre. Phone service is limited in this park, so it pays to be self-sufficient. Ice, bread and milk can be bought at the one-shop town of Wiangaree. 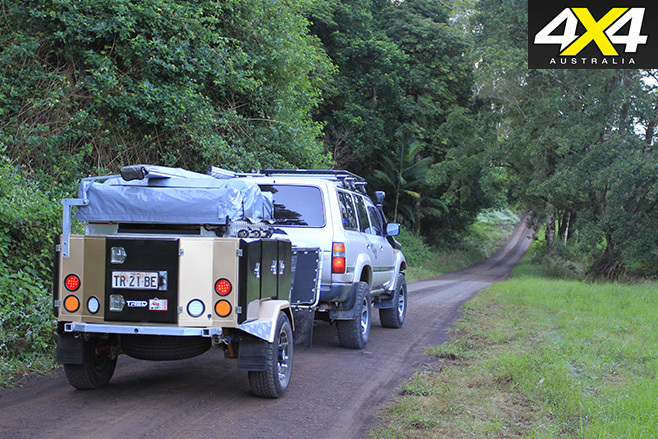 4WD is essential, as the road rises and falls 1000 metres over several steep kilometres. All-Terrain tyres are highly recommended, as the weather can change dramatically and quickly make the road conditions unpredictable. In severe weather all gates are locked to prevent environmental damage, and as a safety measure. The Hema Maps North East Region map is easy to follow. The Grevillea, Brays Creek, Tyalgum and Nimbin local topo maps are also helpful. However, these maps aren’t a necessity as the drive is well signposted. All the roads travelled on this trip can also be located on most GPS systems. You will need to pay the standard national parks camping fee and have a visitor pass. Expect to pay $7 per vehicle per day. At each camping site you will need to pay $6 per adult and $3.50 per child per night. Passes can be bought online, or there are facilities at each entrance and at the camping areas. Additional information can be found at the Office of Environment and Heritage NSW website.